Full of flavor and packed with veggies, this Morningstar 3.5 oz. garden vegetarian burger makes it easy to offer a vegetarian option on your menu! As individuals become more health-conscious and the trend of vegetarianism grows, it's important to have more than just a salad to offer your patrons! 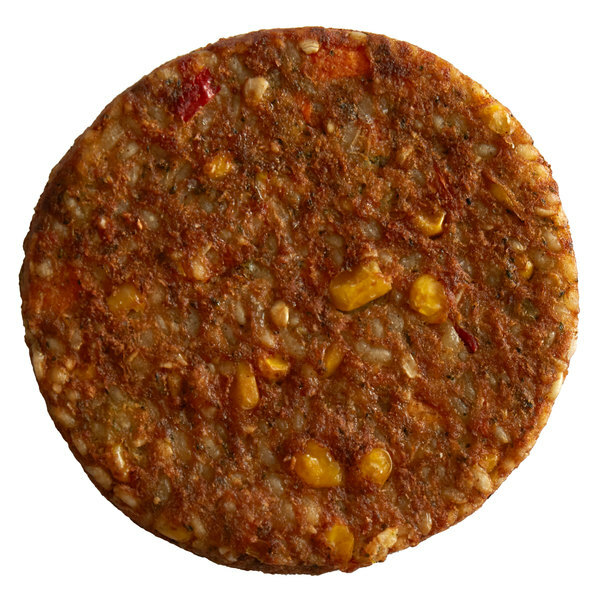 Pre-formed and ready to cook, this burger saves you prep time and helps your kitchen serve consistent meals. Though suitable for vegetarians, this burger is a great alternative for other diners with a desire to avoid red meat, but still wish to chow down on a burger. It offers a delicious, smoky flavor and is packed with vegetables and 16g of protein! Top it with leafy greens and fresh veggies and serve it with a side of chips - this veggie burger is a delicious addition to your menu! Morningstar Farms are pioneers when it comes to producing plant-based foods. For over 40 years they've worked to produce plant-based products that are not only healthy and meat-free, but taste delicious and are better for the environment. Offering both vegan and vegetarian options ranging from veggie burgers, bacon, and everything in between, Morningstar Farms continues to expand their selection and promote plant-based goodness for everyone.